The ever-changing nature of the River North Esk provides the focus for this wonderfully scenic woodland stroll from Edzell, taking in the aptly named Shakkin' Brig on the edge of the Angus village. The walk sets off from the Post Office on the main drag through Edzell. On the corner of the building there;s a sign for the riverside and the ;Shakkin; Brig. You'll discover just why it is so called later in the walk (if you have not already guessed). Follow the lane down between the Post Office and a garage and it descends to a quiet little picnic spot beside the river. Turn left here and well constructed path heads north along the riverbank to reach the bridge a short distance on. Don't cross - that joy is saved until the end of the day - but continued along the west bank of the river. 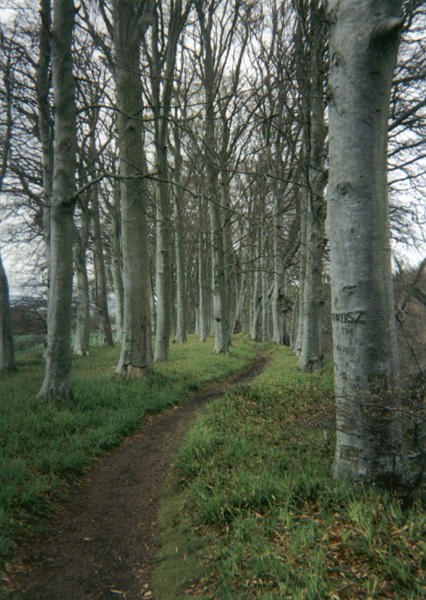 The path skirts along the side of a field usually occupied by grazing cattle before continuing on through a leafy woodland of tall beech trees. There are occasional benches should you wish to stop for a breather. At this point the river is wide and fairly tranquil. However, as you progress up stream it becomes increasingly turbulent as the flow is squeezed between craggy steep-sided banks. The path rises gently as the drop to the right increases in height and fences have been provided to keep walkers safe. A sprightly little waterfall is crossed just before the path joins the B966 road at Gannochy Bridge. Turn right and cross bridge, stepping as you do so out of Angus and into Aberdeenshire. On the other side, turn left and leave the tarmac, passing through a small blue door in the stone wall. This leads to another path running over land belonging to the owners of The Burn mansion. Stick to the path and head north, the river down to your left now. The woodland here is again predominantly beech, although Scots Pine, oak and rowan provide some contrast in the canopy above while, closer to ground level, the yellow flowers of gorse bushes fill the air with a sickly sweet perfume. The river below is wilder now than ever before as the channel narrows further between rock, cascading white water rapids crashing down into deep oil-black pools. The path skirts below the big house up to the right and on from here the way becomes increasingly dramatic and untamed with waterfalls, deep gorges and jagged rocky cliffs creating a spectacular atmosphere. As the path approaches the Pools of Solitude, it climbs up the slope to meet the Glen Esk Road. This is the top end of the walk and the time has come to return to Gannochy Bridge. You can either do this by retracing your steps along the riverside path, or follow the road south. Back at Gannochy Bridge, stay on the east side of the river and pick up a narrow path which leaves the road next to the bridge at ; a telegraph pole. This heads south on the opposite bank to the one followed on the first section of the walk. The path rises up to the ruin of an old sandstone building before broadening out and continuing through a strip of beech woodland separating the river and, on your left, open fields. Further on the path narrows and drops down to the riverside where it is rough in places as it negotiates a maze of tree roots and care should be taken here. However, it quickly broadens out again to reach the Shakkin' Brig. Cross and the rather unsettling wee shuggle you experience midway over amply demonstrates why the span was christened thus. 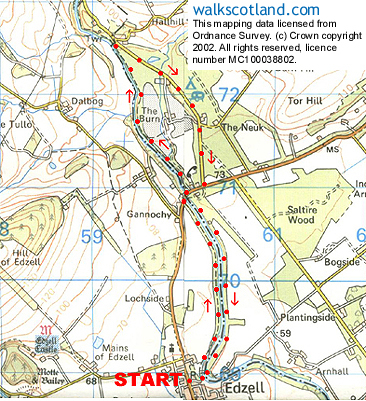 Once over, retrace your steps to Edzell. Parking On-street parking or use one of the two public car parks at the north end of the town. Grading An easy, well graded riverside walk. The way can be muddy in places, particularly north of Gannochy Bridge. Dogs should be kept under close control, preferably on the lead, north of Gannochy Bridge, at the request of the landowner.